Maison St. Cassien is an independent Café and Restaurant in Wimbledon Village. With a wonderful, varied Mediterranean and Lebanese menu, our friendly, relaxed atmosphere makes it a favourite with locals and visitors as well as the famous tennis players during the Wimbledon Championships. 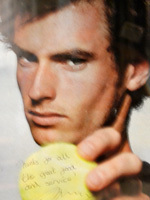 Come and taste the food that Sir Andy Murray and Maria Sharapova have raved about in the press. From small plates such as meze & wraps to main courses of chicken shawarma and mousakka, our menu caters for all appetites. We moved to Wimbledon at about the same time as St Cassien opened in 1998.In that time it has become the social nerve centre of Wimbledon village. It is a restaurant, a café and a safe haven from the ‘chains’ that increasingly invade Wimbledon the village. The incredibly friendly owners and staff attract an eclectic crowd of regular locals and wannabe villagers from all around South West London. During Wimbledon fortnight it is the meeting and eating place preferred by the top seeds…and even boasts a few rugby internationals as regulars. There is no better start to your day than a lazy breakfast or brunch in the terraced sunshine as you watch the world of Wimbledon drive, jog and cycle by. It offers a wide choice of delicious fresh Lebanese inspired cuisine and the coffee is always full of beans. St Cassien really captures the feel good factor of Wimbledon Village life. St Cassien is a unique place in Wimbledon Village. These days there are so many coffee shops to choose from, mostly part of a soulless chain and that completely lack that personal touch. When you pop into St Cassien though, you are met with the friendliest of faces, gorgeous food & a place that is home from home. Owners Ali & George, along with the wonderful staff, ensure it really feels like we’re all part of an extended family. It sits in a fabulous sun spot to top up that summer tan & to cosy up in winter under a blanket whilst watching the bustling world go by. It quite simply plays an essential part in my daily life! It’s never the same if I miss that perfect morning espresso and banter with the regulars. It’s not just me though. My wife, Lisa, and I are often in for the delightful Mediterranean lunches or pop by with our girls for hot chocolate and a treat. Indeed they’ve grown up knowing the cafe as the heart of village life we hold so dear. The marinated chicken is a ‘one off’ and although Ali has steadfastly withheld his secret recipe to all, will be held to his promise to tell my daughter, Mabel-Rose, when she’s 18!. It’s a huge hit with all that visit & it’s clear even the famous faces that regularly drop in, especially during the Wimbledon tennis fortnight, just can’t get enough of it. It manages to have a perfect balance to cater for just an informal, relaxed bite to eat or a slightly more civilised meal & glass of wine. Not forgetting the sensational baclava to finish it all off! — John Scales, Former professional footballer with Wimbledon, Liverpool, Tottenham and briefly England!